Today I'm gonna share with you all one of my most favorite online shopping places! I love buying online because I can compare price, and I dont have to walk around the malls to find my needs, moreover some brands are not even available in my country so the only choice is to buy it from reliable seller. Introducing StrawberryNET this time! 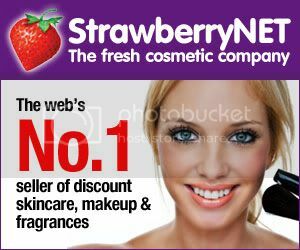 If you're beauty addict and love shopping, you must have known or at least have heard of StrawberryNET before! What's cooler is, StrawberryNET brings over 300,000 products to choose from 600 brands at up to 60% off retail! You can find best deal in internet on here! Awesome! And if you are not satisfied with the products that they sent to you, you can ask for refund as they offer 14 days money back refund after you receive the product. But so far from my experience, I NEVER have any problems with my orders. StrawberryNET always pack my order carefully so it always arrives safely at my place. Some of my favorite brands that I love to buy from them are MAC, Bobbi Brown, NARS, Stila, and L'Oreal. They also carry other great brands for make up such as YSL, Too Faced, Urban Decay, Anna Sui, and so on! no matter how much you purchase from them! ALL The products are included free shipping, so you can also send some products to your friend who live far away from you with this awesome service! I usually receive my package approximately 14 days after ordering. The long process is because of the custom tax in my country, but I consider it as fast already. Once, I received mine for 7 days only! I personally much much love this service! Because sometimes the shipping can be much more expensive than the product that I want to buy. Because of StrawberryNET I can only buy one eyeliner from them, with affordable price + free shipping to my door! How cool is that! Another point to highlight is they offer discount from time to time frequently, as well as loyalty discount and extra discount! You can also have EXTRA DISCOUNT! If you buy more, you save more! they will give amazing Exclusive Free Gifts if you buy over 25USD only! C'mon! How can I hate StrawberryNET! Many brands to choose from with affordable price and lower than retail store, FREE Shipping, Loyalty discount, Extra Discount, and also free gifts?!! I, seriously, love this site too much! I always recommend my friends to purchase from them because this site is just too awesome to be missed! hahaha they have good variety of products and fair price! Glad I can help, good luck! Hi Stella! My name is Stella too, so *toss*! I've been reading reviews telling that their COGS (cost of goods sold) is that low because the products are near to their expiry dates. Is that true? Because I've been yearning for Lancome Effacernes, SN's price is fantastically low! How am I supposed to not be craving about it? But reading all those reviews makes me hesitate... During your six purchases from SN, have you ever encountered products almost expired? hello stella! XD high five!